If you’re stumped on how to find your decorating style, read this article for 5 easy to follow tips! These ideas will help you to narrow down your interior design style. Do you ever scroll through Pinterest or watch an HGTV marathon and love everything you’re seeing? Farmhouse living rooms, glam bedrooms, modern bathrooms? And then get a little overwhelmed with all of the pretty decorating ideas out there? Because if you had ALL of that stuff in your house, it would look like some kind of home decor museum of styles instead of a nicely decorated house? I’ve gotten various questions on how to find your decorating style, especially after I wrote the post about where to start when decorating your whole house. Because after you figure out what room(s) to start decorating, what about if you don’t quite know just what to start decorating with? I’m no expert, but I used to feel kind of lost on what my decorating style was, too so I thought I’d share what I’ve learned works for me over the past few years. Hopefully it can help you, too! 1. Start a ‘favorite rooms’ Pinterest board. Your ‘favorite rooms’ Pinterest board is only for pictures that you absolutely LOVE: the living room with the gorgeous couch, gallery wall and coffee table that all comes together in the best way possible … your dream kitchen with the perfect white counters and cabinets … the bedroom with the beautiful bedspread and pretty nightstands that you can totally imagine sleeping in every night. I’m on Pinterest allllll the time if you want to scroll through my pins or room-specific boards for a place to start! 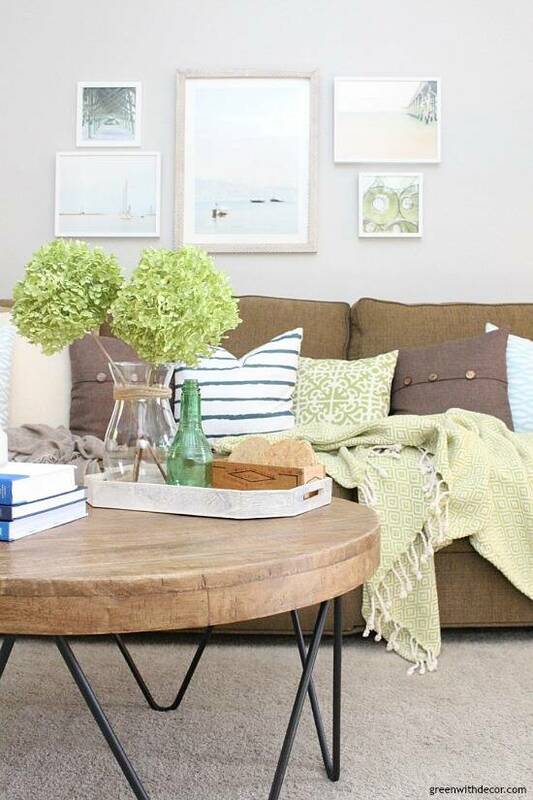 You know those HGTV room makeover reveals you just LOVE?! HGTV has most of their episodes listed on their website. Now this is a little more work, but if there’s a room you really just love, it’s worth saving a picture of it. Find the episode on their website, and add a picture or two of the finished room to your ‘favorite rooms’ Pinterest board. If you’re online shopping, it’s obviously easy to just pin images from retailers’ websites to your ‘favorite rooms’ Pinterest board. If you want some shopping inspiration, I share my favorite light fixtures, artwork, rugs, ceiling fans, etc. on this shopping guides page. If you’re out and about shopping and see the best ever light fixture or wall art, take a picture so you don’t forget. You can even create a ‘favorite rooms’ album within your camera roll so you keep these pictures all together. Just remember to focus on things you LOVE – not just everything you think is pretty or you could end up with 100 pictures on your phone and feel totally overwhelmed. 2. Look for similarities among the images. After you’ve saved a good amount of images to your ‘favorite rooms’ board, look at the board. Do all of the images on your ‘favorite rooms’ board have white walls? Dark walls? Wallpaper? Are there fun statement light fixtures or simple, smaller table lamps? Is there a lot of artwork or are the walls mostly blank? Or a big piece of focal art? If you want more help on artwork, check out this post on tips for choosing the perfect artwork for your home. Are there a bunch of colors and patterns or are the spaces mostly neutral? Which textures keep appearing over and over? Throw pillows, greenery/plants, cozy blankets, natural wood, painted furniture, glass vases, hardwood floors, rugs, gold hardware, mixed metals, etc.? 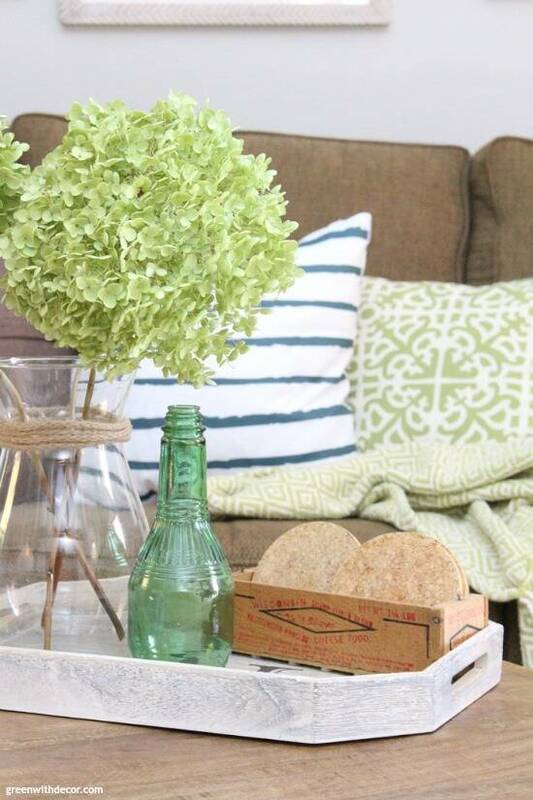 For me, I love neutrals, greens and blues, neutral walls, a mix of wood and painted furniture (in mostly neutral colors), glass, rope, greenery (or hydrangeas! ), and a mix of cozy pillows and blankets. Now that doesn’t mean every room in our house has ALL of those elements (and nothing else! ), but it’s a good guide for me when I’m decorating. 3. Which images stand out like a sore thumb? Do you have mostly modern glam images and then a random farmhouse living room filled with shiplap? Or images with lots of silver hardware or accents and then a random kitchen with gold hardware everywhere? Our old guest room (black, red and tan) didn’t really blend with most of our house – kind of like an image that might stand out on my ‘favorite rooms’ Pinterest board. 4. What do you currently decorate with that isn’t pictured on your ‘favorite rooms’ board? I used to decorate with a lot of red. I started years ago, and then, as things go, I just kept using it. But over time, the images I was loving on Pinterest were filled with neutrals, greens and blues. Get rid of those pieces. Put them in a different room, or local Facebook buy/sell groups are awesome for this. It’s somehow easier to purge stuff when you’re making some money that you can use to buy new stuff. For me it is, anyway. Read this post on how to swap our your color scheme without going broke if you want more tips on switching colors! 5. Pick your favorite five images and use them to guide your decorating decisions going forward. This isn’t an exact science. But pick your top five (or three or seven) images and let those guide you going forward. Focus on the colors, textures and overall feel of those rooms, and implement those elements going forward. I think focusing on the elements of your absolute favorite rooms is way more helpful than saying you LOVE farmhouse style or coastal style or glam style. Because those styles are great and all that – and I can totally appreciate the good design of a chippy, shiplap-clad room or a dark and moody glam space – but it’s not what I want in my house. By focusing on your top five favorite pictures and the elements you love about them, you’ll automatically be picking and choosing the parts of those different styles that you love – all while creating your own decorating style so your home is a place you love. Hopefully this is helpful if you’re feeling stumped on how to find your decorating style. Once I started using this method, it really helped me. What else has helped you narrow down your decor style? I’d love to hear!